It was just life. For Ahmad Baba, that was the thing, and he did not understand it either. Why people out there, walking past him everyday could be so well of, while he, at the age of 75, would have to struggle all his life – making ends meet; only this time, for himself. A grandfather of 27 worked as a cobbler at a five-foot-way of Market Road every day – one of the busiest streets in town. He chose that small space as his ‘office’ as he would like to call it. At times, he was proud of himself, being able to have a business on his own. It was a boy’s dream – his dream to become his own boss. However, it turned out not to be a luxurious one, but a hard one. A man of struggle – that is what he is. He had never intended this to happen. In fact, no one intended it to happen like that either. I came across this old man on one rainy morning. His sitting alone at that little space at the five-foot-way caught my attention. I asked a friend who was driving me at that time to drop me there for a while. I took photos of him, and he had no idea that his picture was being taken. Took a few shots, and I guess the heavy ‘tap’ ‘tap’ of the rain and the voices of people passing by drowned my shutter sound or maybe he was too focus on the shoe he was repairing. Only when I came up close to him and introduced myself to him, he started looking up. He was startled of course, and I apologized for my rudeness. He started talking about his life, and he held nothing back. Listening to his story, I couldn’t help but feeling sorry. At 5am everyday, he took 20 minutes bus ride to that little space to open his business. And so, business would start at about 5.30am everyday. That was nothing to set up really. A plastic sheet placed on the floor to provide a clean place to sit. 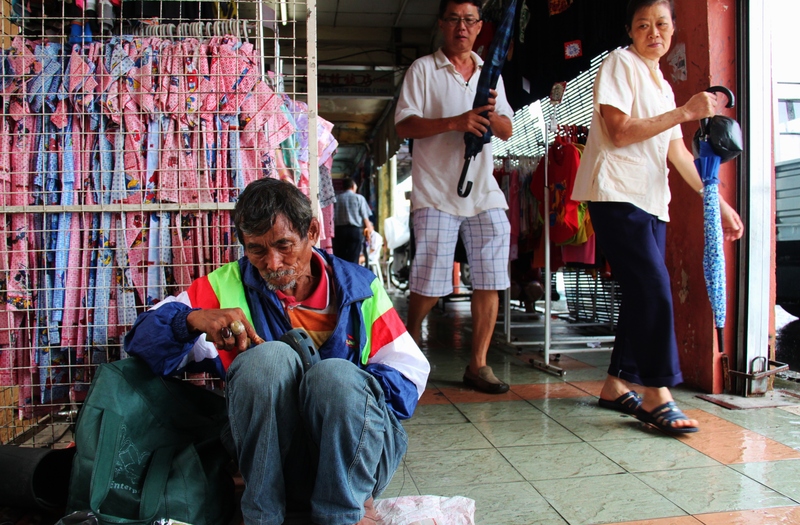 A plastic bag contained needles and other shoe repairing materials – all probably worth just over RM100. It was the only capital he had, once gone, everything’s gone. Not that he was afraid of being robbed. Who would want to rob a poor desperate old man like him. He could not be ashamed of himself. He had a home and a family. He could always stay at home, looking after his grandchildren. He wanted to do that part very much. In a way, it came true, but not all of it. He could not fully do what a grandfather always wanted to do to his grandchildren because his children could not have enough for him. Ahmad is very prudent in his spending. A skill he learned decades ago, when he only earn RM7.50 a day, and raise nine children on his own. He always bought a fruit with him – Jackfruit. That normally would be his lunch. Sometimes, when his son-in-law saw him on the street, Ahmad would be given lunch money, but that never happen all the time. He normally worked from 5.30am until 6pm, sometimes if the business was good, he would continue to after 7pm. Sometimes, he had zero earning. “Sometimes, I do feel like life has no meaning. But, life has to go on,” he told to me once. I do not admire him for being able to hold on to hardship despite his old age. But, I have a lot of respect for this man. Now, thinking back, I regretted for not doing something I should’ve done. I didn’t have shoes for him to repair, but I could have given him the lunch money for the day. That I didn’t do. Thanks for your positive comment. 😀 I am glad you enjoyed it.